← Summer time and the eating is easy…. 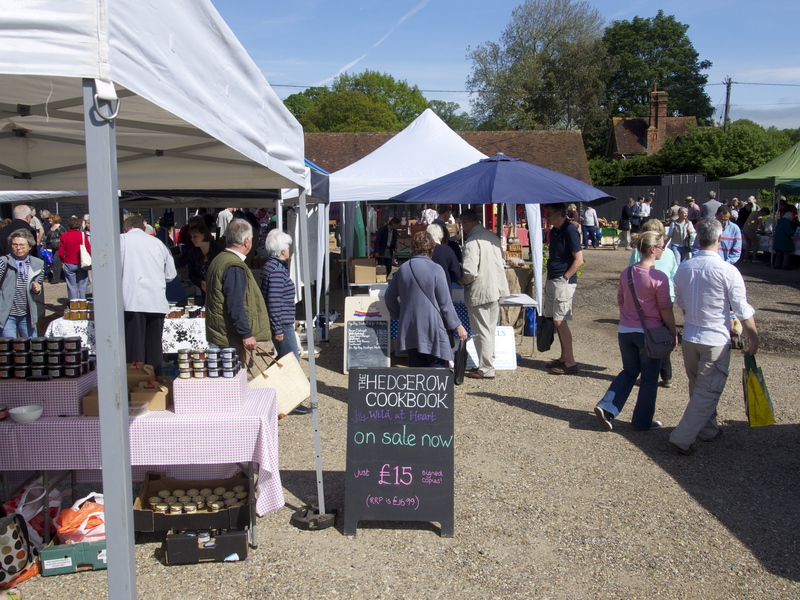 It’s market day at Penshurst on Saturday, and the sun is forecast to shine. I’m not cooking there this month so hurray – a chance to do my own shopping and plan a feast for the evening. My big decision will be whether to cook fish – maybe a salmon – or lamb on the barbecue…. Here’s my monthly advice on what not to miss this month…. At long last summer seems to be showing us some kind of a face and what better setting to enjoy it than down at your local market? It’s been a long time coming and, after such a wet year with higher than average rainfall for a whole 12 months, June has finally broken out and was drier than average. The warmer weather has meant a boost for growers and farmers, and the benefits should be in evidence at the market. So get out in the sunshine and indulge in some shopping for wonderful produce – there really is no better way to enjoy any precious warm days than with a locally sourced feast of summer foods. At this time of year, everything is so good, you can follow the less is more precept and keep preparation and cooking to the minimum. The cold start to the year has been good for STRAWBERRIES, especially now that the weather is warming up to ripen the fruit – so indulge yourself with the best of the British summer fruit all at its peak this month. You’ll discover a completely different gustatory experience from the pale imitations that can be found all year round in supermarkets. Serve with rich golden pouring cream from cattle fed on the lush summer grass and a sprinkling of sugar – add a grinding of black pepper to really enhance the flavour. And don’t miss out on CHERRIES with the season in full swing (Kentish cherries are justifiably world famous), gooseberries, CURRANTS, and wonderful raspberries. This is the month for jam makers and you don’t have to make huge vats of the stuff – just a few jars are incredibly satisfying to produce and make wonderful gifts. Grass fed summer LAMB is now at its very finest and, as a more fatty meat than some (giving it the flavour and keeps it from drying out), is ideal for the BBQ. A boned-out leg or shoulder can be marinated overnight and cooks perfectly in under an hour. Or try cubed lamb for kebabs. On the fish front CORNISH SARDINES are all the rage now – as they should be (the pilchard has had a welcome change of image to reappear in shopping bags as ideal bbq fodder!) And look out for mackerel – bought silvery fresh from the market and cooked the same day to enjoy at its very best. Midsummer is a great time to enjoy CRAB – all you need to make a feast is to serve dressed crab with simply buttered new potatoes and good mayonnaise, home made if possible. Serve with a chilled glass of one of the excellent English white wines that are now coming onto the market, such as the award winning Ortega from Biddenden Vineyards, a personal favourite. The perfect party dish for the barbecue as you can cook it and leave it to rest ready for easy slicing up whilst you cook the aubergines over the hot coals. 1 Open out the lamb and place in a shallow dish. Whiz the mint, lemon rind and juice, garlic, coriander, cumin, cayenne, yogurt and seasoning in a blender. Pour over the lamb and turn to coat the meat completely. Cover the dish with cling wrap and chill overnight if possible but at least for 2 hours. 2 Light the barbecue (or oven to 200C gas mark 6). Remove the lamb from the marinade and cook on the barbecue for 45 – 50 minutes turning until just cooked through but still pink. Remove the lamb to a warm platter, cover loosely with foil and leave to rest for 10 -15 minutes. 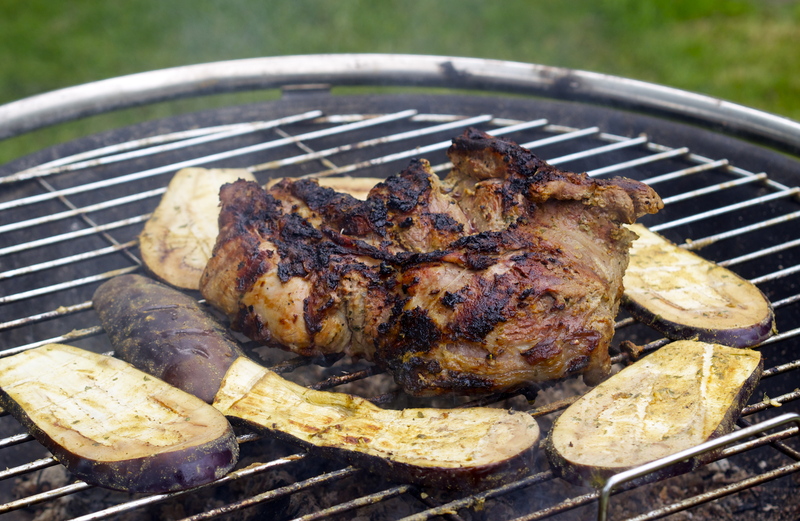 3 Brush the aubergines with the leftover marinade and cook on the barbecue for 8 – 10 minutes (while the lamb is resting) until charred and cooked through. Serve with the sliced lamb. This entry was posted in Farmers Market, In season and tagged barbecue, in season, lamb, Penshurst, Penshurst farmers market, recipes, What to buy. Bookmark the permalink.